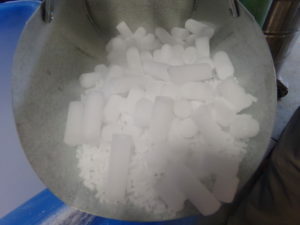 Dry Ice is the quickest, most cost effective way to keep material frozen. Dry ice is basically solidified Carbon Dioxide (CO2). It is kept at -109.3º F. Once exposed to warmer air, it will sublimate, or begin reverting back to its original gaseous state. Therefore, dry ice should be used immediately upon purchase, or placed in a cooler with robust insulation. Once manufactured, dry ice will essentially begin its sublimating process immediately. Maine Oxy carries dry ice nuggets and dry ice rice sizes. Browse the varieties to determine the product that will best serve your needs. Our Store Managers are also happy to help you navigate the process. Dry Ice is currently available for pick-up ONLY. We have some packaging options available, but recommend that customers bring their own container.